As one of the best OBDII Diagnostic Scanner Tool for Ford Mazda cars, the Ford VCM 2 VCM II Diagnostic has a good reputation for its famous IDS Software used,stable performance as well as great PCB adapted at a costive price. And both of these good reasons can account for why VCM 2 IDS was so hot and big welcomed. And following is a Ford VCM II FAQs Guide For All autocardiag.com customers,maybe this guide will help all vcm 2 users fix some installation,usage problems. Q1 : What is the advantages of Ford VCM II over than Ford Mazda VXDIAG VCX NANO ? A1 : Both of these two tools are for ford mazda cars diagnostic,but from customer’s feedback,the VCM 2 more stable to use.see the comparison between them right here. Q2 : How to Install and Setup VCM II With Ford Mazda Cars ? 1. Turn the computer time to January 1,2016. 5. Activated the license,copy your key from DFstd-key.Then ready to install the Deep Freeze,this software will come out automatic. 6. When 3 days trial used, Adjust the computer time to the date of installation(1/1 2016) will get another 3 days. 1.Pls Disconnect the internet and close your anti-virus software before using. 2.TWO Software(For Fd/For Md) must be installed on different PC with WINDOWS XP SP3 or Win7 32bit system. Q3 : How to Fix Ford VCM 2 “No Boot-up,LED No Function” Problems ? 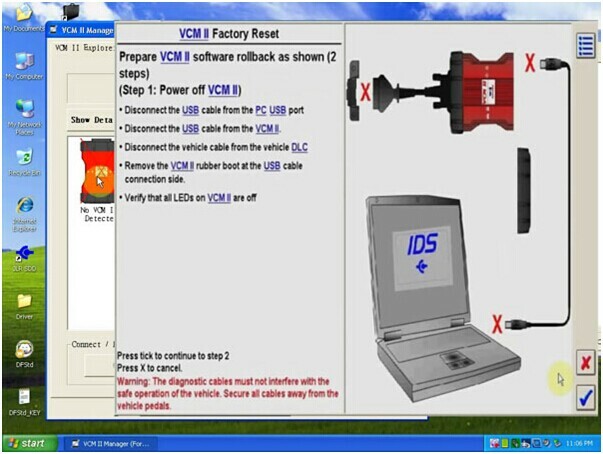 A3 : if you met the problem like VCM II will not boot-up properly, VCM II LED’s not functioning properly, etc,then maybe you can fix the problems by resetting your Ford VCM II Diagnostic Tool to factory setting,then the problem will be fixed. Q4 : How to Reset Ford VCM II Back to factory setting ? Step 1 : Shut down the IDS application if it is running. Step 2 : Disconnect the VCM II DLC cable from the vehicle. Step 3 : Disconnect the VCM II USB cable from the VCM II and PC. Step 4 : Remove the rubber boot on the VCM II that is opposite the DLC connector to expose the Recovery Mode Switch. Step 5 : Start the IDS application. Step 6 : Press and hold the plastic tab. Do not release the tab until Step 9. Step 7 : Connect the VCM II to the PC using the USB cable. Step 8 : Wait for the VCM II’s Power LED to remain on and for the unit to beep. Step 9 : Release the plastic tab – the VCM II will be in Recovery Mode. Step 10 :The IDS pop-up window below will appear notifying the user that a new version of VCM II software is available. 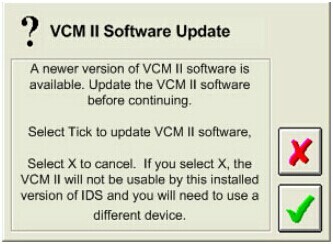 Select the Tick button to update the VCM II software. Step 11 : Follow the IDS on-screen instructions to complete the software installation. More and more Ford VCM 2 VCM II User Guide will be upated in autocardiag.com official blog, pay attention to it to get more details.